repositories in business intelligence projects iii. How to control sprawl of data sources, reports and business intelligence content with permissions and workflow approvals. iv. Connecting your data sources with Business Connectivity Services. Best practices for configuring and securing SharePoint 2010 business intelligence applications. 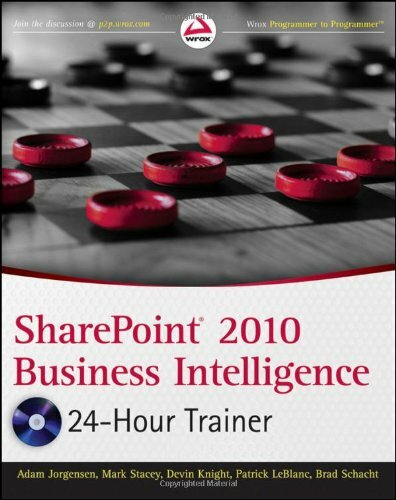 Integrating Office 2010 and SharePoint for intelligent reporting. This specifically will cover how the Office user or analyst can create reports and dashboards right from within MS Office 2007 and 2010 and publish them to SharePoint. Implementing advanced analytics through PerformancePoint and business connectivity services. These analytics will provide time based analysis, forecasting, mapping, drill through and other advanced visualizations. Tuning and scaling SharePoint SQL databases and applications to support the new load that the reports, analytics and dashboards will place on the system. I am unaware of any book that covers this topic. Best practices for planning and implementing your SharePoint business intelligence project plan. This is a 24 hour trainer book, so it will have an explanation of the topics in each lesson along with a walkthrough. Each specific lesson is targeted to take about an hour each and accompanied by a video walking the reader through the lesson and the step by step "Try It" section at the end of the lesson. Why Sharepoint For Business Intelligence?